Chainarong Monthienvichienchai, chancellor of St. John’s University Bangkok, has dedicated his life to Catholic education and St. John’s group of schools providing education in kindergarten, commerce, technology, polytechnic, international programs to doctorates. Chainarong’s other passion is communication. After his return from his five-year contract as a broadcaster with the BBC External Services in London, he hosted for eighteen consecutive years a highly successful quiz program for students called IQ180 which won numerous television awards as the best education program in the country. He was the first Asian to be elected president of Unda, an international Catholic organization for broadcasters, in 1987. Pope John Paul II appointed him a member of the Pontifical Council for Social Communications from 1987 to 1994, and he has since been appointed as a Consultor in the same Pontifical Council in the Vatican since 1995 to the present day. 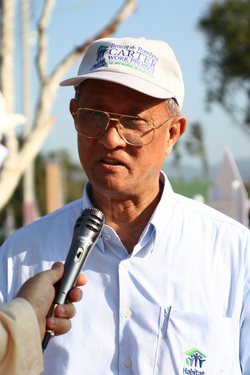 In 2004, Chainarong was the first Asian to be elected president of Serra International, which involved in working with families and helping to promote vocations to the priesthood and religious life. Lately Chainarong has devoted more of his time for charity. Since 2004, he has been chairman of Habitat for Humanity Thailand, a non-profit organization known the world over for its work in building affordable homes for the poor families. He is married to Dr. Chintana, with two sons and twin daughters.